Last weekend saw protests at a gurdwara in Leamington Spa. Protestors objected to the wedding of a Sikh woman to a Hindu man as it would involve the Sikh ceremony of the Anand Karaj. Meanwhile, a gurdwara spokesman told the BBC they supported interfaith marriages and that “the general consensus is people are respectful of mixed marriages if the traditions are respected.”. Most listeners would probably find the idea of protests at a wedding insensitive and abhorrent. After all, we’re talking about the most important day in a couple’s life. However, it’s important to know the context to this first. The Anand Karaj, or blissful union, was introduced in the mid 16th century by the fourth Sikh Guru. For Sikhs, marriage isn’t just a wedding of two people, but the sacred spiritual union between the couple and the Almighty, with the couple’s souls being the brides to the Almighty’s bridegroom. In the 19th century, Sikhs in British India were considered to be a Hindu sect and had to use the Hindu fire ceremony to marry legally. The legalisation of the Anand Karaj in 1909 helped promote Sikh revivalism. Other developments quickly followed, including laws which handed control of Indian gurdwaras to an elected committee of Sikhs. When the community settled in Britain in the 1960s, they brought that committee system with them. They worked hard to build places of worship and preserve their practices, but some changes were made to fit in. For example, Sundays became the main day of worship due to working patterns, and marriages between Sikhs and non-Sikhs were accommodated for. A new Sikh identity was slowly formed. That brings me to the protests. At the heart of the dispute are theological differences between two groups. On one side is a democratically elected committee that supports how the faith has evolved in the UK, including interfaith marriages in gurdwaras. On the other is a group of younger British-born Sikhs who consider such changes as compromises that run contrary to their beliefs, who want to ‘reclaim their faith’ and who view the Anand Karaj as exclusive to Sikhs. Both groups think they’re right. Both have supporters in the wider community. 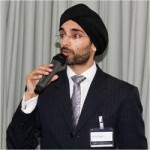 A middle ground was attempted last year, but some committees such as Leamington Spa refused to sign up to an agreement to stop conducting the ceremony between Sikhs and non-Sikhs.